Southeast Asia: Next boom market? ElringKlinger makes thermal shielding in Indonesia. The supplier sees opportunity in Southeast Asia because of tightening emissions limits there. MUNICH -- Auto industry executives are still upbeat about China, but their enthusiasm for the other BRIC countries has waned. New markets are in demand -- and are being discovered -- such as Southeast Asia. Stefan Wolf, CEO of German parts maker ElringKlinger, sums up the situation: "You can delete the letters B, R and I from the once highly praised BRIC nations. Only the C is left. By contrast, the ASEAN zone offers strong sales potential for the vehicle industry." The B, R and I stand for Brazil, Russia and India. ASEAN is the Association of Southeast Asian Nations, a political and economic organization of 10 countries. Raphael Berthoud, who is responsible for India and Thailand at Faurecia Interior Systems, stresses that "Southeast Asia, especially Thailand, is a major growth market for the automotive industry." Japanese automakers have long had a presence in the region, which has about 600 million inhabitants, but Ford and General Motors have settled into Rayong, Thailand, as well, Berthoud said. In addition, Volkswagen assembles vehicles from kits in Malaysia with partner DRB-Hicom. Rudi von Meister, president for the Asia-Pacific region of ZF Friedrichshafen AG, emphasizes that "many of the next 15 countries with up-and-coming economies are located in Southeast Asia." ZF has been active in a number of these "BRIC successor states," in some cases for years. Ralf Dieter, CEO of Duerr AG, also has confidence in Southeast Asia. "Experts expect vehicle production in Thailand, Indonesia and Malaysia to rise about 40 percent by 2018," he said. "In the course of this growth, international automakers will expand their production capacity in the region." In 2012, the ASEAN nations manufactured more than 4.2 million vehicles, including nearly 2.5 million in Thailand. The highest sales were in Thailand (1.4 million), Indonesia (1.1 million), and Malaysia (627,000). PwC's automotive analyst group, Autofacts, predicts a 2.2 million-unit increase in passenger car production in Southeast Asia by 2020. The countries east of India and south of China also are attracting automakers because the wage levels are even lower than in China. 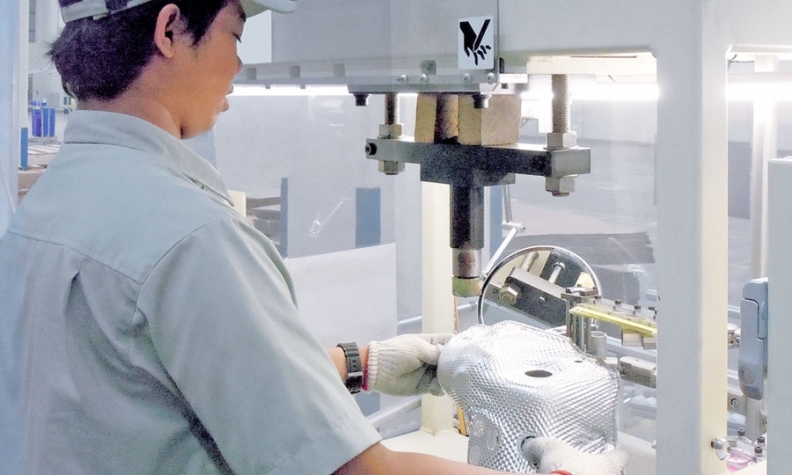 Aside from the growth in volumes, ElringKlinger, which makes cylinder head gaskets and other parts, sees great opportunities in Southeast Asia because of the increasingly tight emissions standards there. The supplier could benefit disproportionately from the new limits. ElringKlinger is focusing on Indonesia, Thailand, Malaysia and Vietnam, where more than three-quarters of all ASEAN inhabitants live. And it is betting heavily on Indonesia, which has a population of about 250 million. Vietnam and Thailand also appeal to ElringKlinger. Car production in Thailand, excluding microcars, nearly approximates the levels in India. Suppliers are proceeding in various ways. Duerr, for example, imports equipment for its customers in Southeast Asia, mainly from Chinese factories. ZF has been manufacturing in Rayong since 2002; 170 employees build axle systems for BMW, Ford, GM and Mercedes-Benz at the site. In Kulim, Malaysia, ZF launched a factory in late 2013 in which 70 employees build car axles for a nearby BMW plant. Faurecia has been in Thailand since 1996. Its three factories in that country employ about 1,000 people who work for the company's interior and emissions control divisions. Exhaust systems are also produced in Malaysia. So far, ElringKlinger has mainly produced thermal shielding parts in Indonesia for Japanese customers. In the future, the products will include cylinder-head seals, special seals and plastic housing modules. Suppliers use their ASEAN work forces almost exclusively to supply customers within the region. The political and social crisis in Thailand is clouding prospects there. Some suppliers are showing declines in their Thai business while others have felt no effects from the problems. ZF and Duerr, at least, assume the country will stabilize in the medium term.